29 November 2018 (Toronto, ON) – Bravado today announced an exciting partnership with LINE FRIENDS to bring the BT21 product line, featuring characters beloved by millennials around the world, to Canada for the first time. Following sold-out shopping experiences in New York City and Hollywood, BT21 customers in Toronto will have the exclusive opportunity to shop a wide range of BT21 merchandise, including limited edition BT21 Toronto apparel, only available at the pop-up shop. The store will open in Scarborough Town Centre (300 Borough Dr, Scarborough) from November 30 to December 7 (or while quantities last). The official line-up begins at 6 a.m. on November 30 at Entrance 1. The first 700 customers receive a free BT21 poster. Follow Universal Music Canada and @UMusic across all social platforms for more information and exclusive contest opportunities, using the hashtag #BT21Toronto. LINE FRIENDS is a global character brand featuring 11 characters which were originally created for use as stickers for leading mobile messenger application LINE and its 200 million active worldwide users. The company has emerged as a global creator by introducing new Intellectual Property (IP) like BT21, characters created together with global boy band BTS, in addition to Animation Running Man and Usamaru. LINE FRIENDS also has collaborated with a number of renowned brands including LAMY, Beats by Dre and Brompton, all aligned with the company's philosophy and values to showcase premium character products. 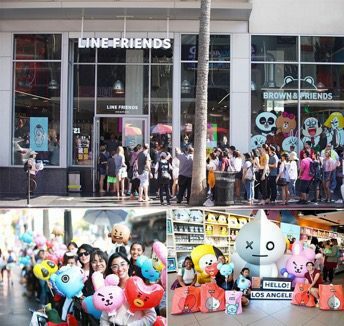 More recently, LINE FRIENDS has operated more than 120 stores globally in a total of 11 markets worldwide, in trend-leading cities such Seoul, Tokyo, New York, and Shanghai, and became an independent company in January 2015. For more information please visit www.LINEFRIENDS.com. Bravado is the leading global provider of consumer, lifestyle and branding services to recording artists and entertainment brands around the world. Part of Universal Music Group, the leader in music-based entertainment, Bravado represents artists worldwide, offering complete merchandise solutions through an extensive catalogue of services including sales, licensing, branding, marketing and e-commerce. Bravado works closely with new and established clients to create innovative products carefully tailored to each artist or brand. See BravadoCanada.com for information.